School is out and summer’s here! No homework, tests, or projects (that are as much work for parents as their kids) it’s the perfect time of year. However, school will come again, and the staff at Frecklebox.com thinks reading is an awesome summer activity and a fun way to stay ready for school. Here are our top picks of children’s books that every kid should get a chance to read! This classic children’s book takes a child’s imagination to a whole new level with it’s exciting story and awesome monsters. This tale is beautifully illustrated and will make your kids excited to go to bed so that they can begin their own adventures! Max, the main character, is a boy that discovers the land of the wild things, and gets himself into action, adventure, and a whole lot of fun! This great children’s story will take your child through a baby bat’s life when she loses her mother. She is found by a mother bird and told that everything she does that is like a bat is wrong, until she finds her mother and learns that her instincts are right. This book has great illustrations and will teach your kid about the birds and the bats! This classic tale is for children a bit older, and will make holes take on a whole new meaning! Stanley Yelnats, the main character, may be the unluckiest person alive. As he tries to conquer his bad luck he is faced with all kinds of adventures, including mystery and a family curse from years ago. This adventurous book is imaginative and funny, creating an intriguing story that any kid will love! This adorable classic will show all of the things that could happen by sharing a cookie with the mouse in the house. The sweet illustrations are fun and entertaining, making this a must read! This cute tale will teach the ideas of cause and effect, while taking your child on a fun adventure only fit for a boy and his mouse! This quirky tale takes you through the story of the three little pigs, but from the wolf’s perspective. The wolf simply had a cold and needed to borrow sugar, he wasn’t trying to blow the houses down! This book is fun and very different, showing there are two sides to every story! Every child should get to read this funny tale that takes on a whole different meaning when you hear the tale of the three little pigs. This great story teaches kids how important it is to help the less fortunate. When Opal, the main character, and her father move to a new place, she finds a big, ugly, ratty looking dog in the Winn-Dixie supermarket. This sweet, funny, ugly dog teaches Opal that making friends is easy, and that people shouldn’t be judged by their looks. Opal learns about her mother and herself, and realizes that friendship can be found anywhere. This book is beautifully written and any child will love it! This fantastically illustrated book teaches kids that what counts in a person is on the inside. The rainbow fish is beautiful, and because of his beauty, he gets cocky and even rude. All of his friends stop being friends with him, and he can’t seem to figure out why. When he asks the wise octopus, he tells him to share his beauty with others. This story has a great message, is beautifully illustrated, and will take your child on an adventure of learning what beauty truly is. This classic tale follows an unyielding friendship between a boy and his tree. Throughout the boy’s life, the tree will always help him, and will always give him anything he asks. Even when the boy asks to cut down the tree to build a boat, the tree agrees. The boy comes back to the tree, which is now a stump, as an old man and sits, the tree’s last wish. This book shows a beautiful friendship, and teaches any kid what a true friendship really means! This is is a hilarious series about the adventures of a couple of grade school boys. The humor appeals to kids and their parents so if you have a younger child, this is a great one to read together. 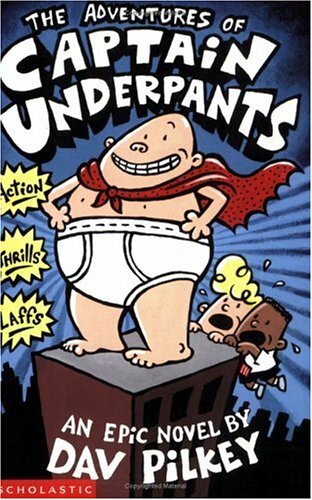 Kids who don’t like to read like reading these books! Take a surf through the author’s website to get a very good sense of his style and humor, http://www.pilkey.com/. These are some great books that are not only classics, but perfect for your child’s summer reading! There are many other fantastic reads to choose from, and some awesome sites for these include http://childrensbooksguide.com/top-100, http://www.teachersfirst.com/100books.cfm, and http://www.ivillage.com/best-childrens-books-age-age/6-a-364926. A great way to escape the summer heat is going to your local library, where they have all kinds of books, and sometimes have author visits and fun events! Whatever the book, wherever the reading happens, get out and read this summer! Previous: Previous post: Some great resources for parents (PBS Kids, Education.com) and more.